I am in Chicago right now. Greg Whiteley hired me to shoot a little industrial spot with him for Preferred Freezer Services. The company runs huge warehouse-sized freezers—storing frozen food product for various companies. This particular plant in Chicago is really high tech—being all computer controlled and using giant robotic cranes to move the inventory around without any human involvement except for supervision. It’s pretty cool… or should I say COLD. The freezer section is -8ºF. We were planning on shooting in this temperature with some uncertainty regarding how well the camera equipment was going to hold up. We didn’t put much thought into how WE would hold up. When we scouted the freezer, let me tell you, it was cold! I don’t think would’ve been possible, honestly, to spend more that a few minutes at a time in there. We soon found out that on the other side of the warehouse, there was another section of the freezer that was “only” 28ºF. It only had one robotic crane, but we would be able to have more control over it. We went over to take a look and it was a welcome alternative! It seriously feels like paradise compared to the other one. We brought along Greg’s HVX-200 and also rented a 5D Mark II with a 14mm wide angle lens and a 24–105mm zoom lens (both Canon). This camera along with these lenses are really awesome to work with. We haven’t even used the HVX-200 yet (except for a quick time-lapse shot we needed to get while we were working with the 5D). I don’t think we will at all, really. The 5D is so much more enjoyable to work with and has been giving us superior images. We’ve been getting great shots with it and the light sensitivity is so amazing. We were worried about it operating in sub-freezing temperatures because the Canon rep said that it won’t work in anything below freezing—but it’s been working great! Yesterday, we wanted to shoot the “life of a pallet” in the freezer and show what a pallet of product goes through as it is taken from a truck and eventually placed into a shelf in the freezer. 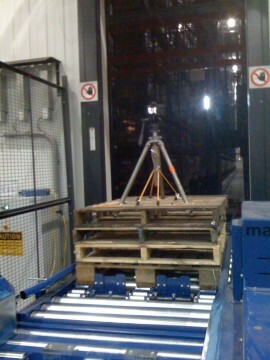 So we strapped the camera and tripod onto a pallet using bungee cords and sent it through the process a couple of times. The first time we sent it in, we really didn’t know what to expect when it came back out. We assumed it would be fine—but the images of it encrusted in ice (like the DeLorean in Back to the Future) or completely missing off of the pallet were “funny” thoughts to entertain as we waited nervously for it to make its way back out to us in the loading dock (which, by the way was a tropical 35ºF). Sending off the rented 5D Mark II to its uncertain fate. The camera came back completely intact (although, it’s time circuits were exactly 1 minute behind and still ticking!). We played back the footage and we were really excited to see how sweet it looked. I used the 14mm wide-angle lens and put the camera in manual mode at 1/50th of a second shutter speed, 24fps and wide-open aperture (f2.8). Because I wouldn’t have physical control of the camera as it passed from the loading dock into the freezer, I set the camera’s ISO to the “auto” setting—knowing that it was pretty dark in there and that it would eventually crank itself up to 6400 ISO. I was really impressed! I wish I could show you some of the footage here. [Please read the next post to see footage.] It looked like a video game or some Disneyland ride a la Star Tours. We weren’t able to get some of the angles we were hoping for so we ended up hopping onto the crane itself and getting some hand-held shots as the crane was driven up and down the warehouse isles. Tomorrow, we go into the -8ºF freezer, but this time we will be locked in and surrounded by multiple robotic cranes while in full-operational mode. Sounds dangerous. I think it is, actually. I don’t know how long we or the equipment will last, but we’ll give it a shot. We need some specific shots that we can hopefully get quickly before any of us turn into popsicles.